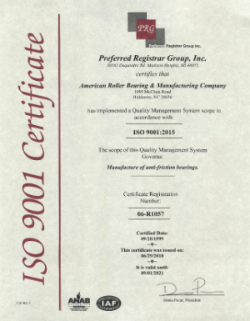 AMERICAN ROLLER BEARING COMPANY (AMERICAN) is a leading manufacturer of quality anti-friction bearings in the industrial markets we serve. We are dedicated to serve industry and we will strive to manufacture products that meet or exceed our customer's requirements and specifications 100% of the time. Our company will continually involve all our people for the purpose of improving our processes, manufacturing quality products the first time, and delivering these products to our customers as required. American is a leading manufacturer of high quality bearings in an industry noted for high quality products. 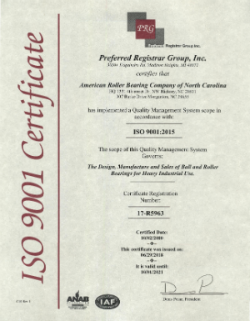 We are ISO 9001(2008) certified and use this as a basis for our comprehensive Quality Control System. Our philosophy is simple: every employee is responsible for quality in the proper manufacture of our various lines of heavy duty industrial bearings. Our Quality management team works hand in hand with every worker and supervisor to insure that components are processed correctly, the first time and everytime. This means our costs are lower and customer’s bearings are shipped on time. A by-product of this close interaction between Quality, Management and the Work Force is that we welcome suggestions from the workers doing their jobs. This often results in more efficient methods of performing the various processes and improvements in the product as well. Because of this, we are continually improving our manufacturing techniques and equipment in order to provide a better bearing for our customers.